Bueno Dias. Por favor, perdoneme mis errores desde la Virgen de Guadalupe. Hello. Please forgive my errors about the Virgin of Guadalupe. I speak "un poquito" Spanish.I am neither Catholic nor Mexican,but a date celebrated in honor of the Patron of the Americas is worthy our study. Today is the Feast Day for the Virgin of Guadalupe,commemorating the appearances of the Virgin Mary to the poor Aztec (Nahuatl) Juan Diego in 1521. Juan had already converted to Christianity. For those of you who remember "In 1492 Columbus sailed the ocean blue," you know this is within thirty years of the discovery of the Americas. told Juan to hunt for flowers on the top of the hill. He found roses--an impossibility in the dead of winter. When he opened his coat--a rough covering made from cactus (ouch!) --roses tumbled out, but even more amazingly, a portrait of the Virgin, exactly as she appeared to Juan, appeared on his coat. One of the most striking facts to me is that the highly-perishable cactus cloth has remained intact for almost five hundred years. The Virgin appeared with dark skin, like the Aztecs, and spoke in their native language. "La Morena" also reminded Aztecs of the goddess Tonantzin. They converted to Catholicism by the millions. Doubts have been aimed at the historicity of the visions, but I am not qualified to assess the arguments. Certain things ring true to me. One of them is the mass conversion of the Aztecs. A people who believed the rising of the sun depended on human sacrifice wouldn't give up their world view easily. The Nican Mopohua records the early oral accounts of the apparition where Mary introduced herself as "the mother of the One for whom one lives." A shrine was built on the site of the appearances, in what is Mexico City today. Today's basilica, home to Juan Diego's mantle, is one of the most important sites within the Catholic Church. 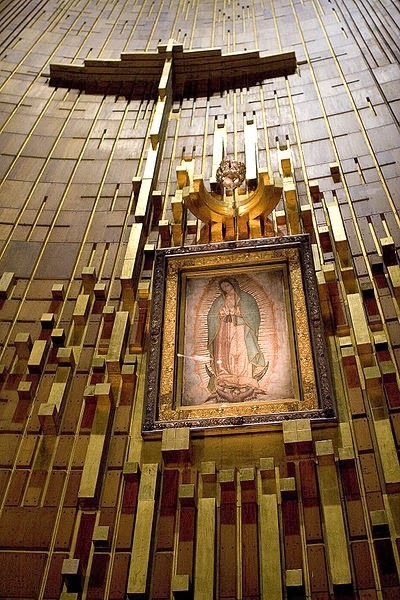 The Virgin of Guadalupe holds a special place in the history of Mexico, in addition to religious matters. Migual Hidalgo y Costilla claimed her as the Patron Saint of his revolt against Spain. Her image appeared on their banners, and their battle cry was "Long live the Virgin of Guadalupe." Similar banners appeared with Emilio Zapata in 1914 and later rebels 1926-29. This is Darlene Franklin, and Mexico has held a special place in my heart for many years. Glad you enjoyed it, Jackie. I found the study interesting. Fascinating! I always learn something when I read your blog posts. Julie, Robin, I love learning more about subjects that interest me. And Mexico definitely qualifies, but Guadalupe is celebrated in the U.S. as well. Thank you for sharing this informative post, Darlene! It always fun to learn something new!! Darlene, this may be the beginning of a new book for you. It could take place in Mexico City. Thanks for sharing your historical knowledge.